On this track we will discuss time management for the caregiver. Would you agree that an important part of taking care of yourself and your family is managing your time efficiently? In my practice, I implement six interventions that can help foster productive time management. These six interventions are the daily to-do list, direct delegation, familial delegation, Avoiding the Supercaregiver Trap, research services and scheduling phone time. I find that one often overlooked time management technique for care givers is the daily to-do list. Clients start each day by writing down projects to complete, calls to make, and appointments to keep that day. Throughout the morning and afternoon, the client checks off tasks as they are completed. At the end of the day, the client moves unfinished items to the beginning of the next day’s list or to another day. 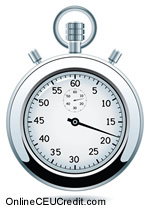 Might your client decide an item can wait for a few weeks, or be deleted altogether? Marking off items and keeping tasks organized can provide a sense of accomplishment and order for the caregiver of someone who has cancer. Would listening to this track during a session be beneficial? Is your client in touch with his or her strengths and weaknesses? Could he or she benefit from putting a star on his to-do list by the items that involve his weaknesses and delegate the task? Often, I find that clients can think of people such as friends, family members, or volunteers who can take on these chores. I suggest my clients write the names of helpers by the star, then call them and ask for their help. For example, Felicity hated to cook. Felicity, age 51, stated, "Whenever I have to prepare dinner, I storm around the kitchen banging pans and slamming drawers! I try to be wonderful for Mike, but I get upset, and he can hear me storming around the kitchen." I felt that anything else Felicity might do for Mike could be overshadowed by her anger. I stated, "If you hate to do something, find someone else to do it. If family or friends won’t help, then call United Way and ask which of their agencies has volunteers. If no one can help, then hire a college or high school student for a nominal fee to do whatever you can delegate. Don’t be put off if the student doesn’t do the job as well as you would have. The goal is not to have everything completed perfectly, but to allow you to focus on the chores you have to do, the ones you enjoy, and the ones you do best." Think of your Felicity. Could a direct-delegation technique work for your client? In addition to the daily to do list and direct-delegation, let’s discuss familial delegation. If a client is taking care of a sibling or parent, he or she can hold a family meet­ing. You might encourage your client to have ready a list of all the jobs required to take care of the patient. Do you remember Cathy from track 5 who was her mother Paula’s caregiver? In Cathy’s family meeting she stated, "This is what has to be done. This is what I can do. Let’s find a way to split the rest of the chores." If your client’s family doesn’t live nearby, perhaps he or she can hold the meeting by telephone conference. At the very least the family may be willing to send money to pay for someone else to do the services the patient needs. Family members can also help clients find resources by calling private or government agencies. They can gather information and send the client brochures and forms. I stated, "You might consider setting boundaries and delegating tasks. Suppose Paula lived in another state or refused to move in with you. In that case you would be forced to find some way to get her resources. You’d have to. Unfortunately, when someone lives close by, doing everything yourself becomes a habit or is simply easier. Next time you offer to help, imagine the person lives far away. Stop and ask yourself whom you would call for help. That same resource may be available to you right now, in your own city." Think of your Cathy. Could familial delegation benefit your client? Perhaps Avoiding the Supercaregiver Trap might also benefit your Cathy. 1. Am I trying to do this all myself because I was taught I have to? What benefits—emotional or social—do I derive from worrying about nothing but the patient? What am I getting out of doing it all myself? 2. Are there parts of my own life I am ignoring or neglecting? Which ones? Why? 3. Would I be more helpful and more effective if I found others to help me? 4. Am I afraid to delegate? What is the worst that could happen if I asked others to help me? 5. If I could find others to help, what would I do with the free time I would then have? Would you agree that delegating can be essential to a client’s well-being, to relationship with the patient, and to the patient’s feelings? I find that if the client’s loved one senses that he or she is overburdened, the patient may feel guilty, angry, or sad, or she may stop telling the client what her needs are so as not to burden the client further. What Paula and most other patients want is an open, caring relationship. I stated to Cathy, "To achieve this, you may have to reevaluate how you are caring for her. Have a discussion with her about how she perceives you as a caregiver." Another time management technique is to research the available ser­vices that the patient may need in the future. Cathy asked Paula’s doctor and nurse what services may become necessary. They introduced Cathy to a hospital social worker who guided her through this maze of services and help Cathy to complete the required forms. Once the doctor has decided on a treatment for Paula, Cathy called the insurance company to inquire about coverage and completing those forms. Cathy stated, "I was able to ex­plain what services I thought mom would be needing, such as equipment or home health services. Then I ask the insurance company to go ahead and send the forms, so I wouldn’t have to fill them out during a crisis." You already know that sometimes one coverage expires, and it takes weeks to apply for the next type of coverage. And the government may require copies of bank statements and other legal documents that take time to acquire. By researching services in advance, clients acting as caregivers can save time later when time is less available. Another time management technique is for the client to schedule when he or she wants to talk on the phone. I encourage my clients to then turn on the answering machine the rest of the time. Would you agree that this arrangement can enable clients to regroup and enjoy time, either alone or with the family? Clearly, if clients jump as soon as the phone rings, they are never going to have those much-needed, uninterrupted, rejuvenating moments. Finally, you might encourage clients not to waste time questioning their decisions. Do you agree that once clients make decisions, they are best let go? Under these conditions it’s easy for clients to be hard on themselves. On this track we have discussed time management techniques. In my practice, I implement six interventions that can help foster productive time management. These six interventions are the daily to-do list, direct delegation, familial delegation, Avoiding the Supercaregiver Trap, research services and scheduling phone time. On the next track we will discuss compartmentalizing cancer thoughts. What are six interventions that can help foster productive time management? To select and enter your answer go to CEU Answer Booklet.